Have ordered this product before and as before found it to be a very good product for a very good price. Got cartridge, put in printer, got nice black text. Better output than the cartridge purchased from a worldwide cartridge store that cost more than twice as much! 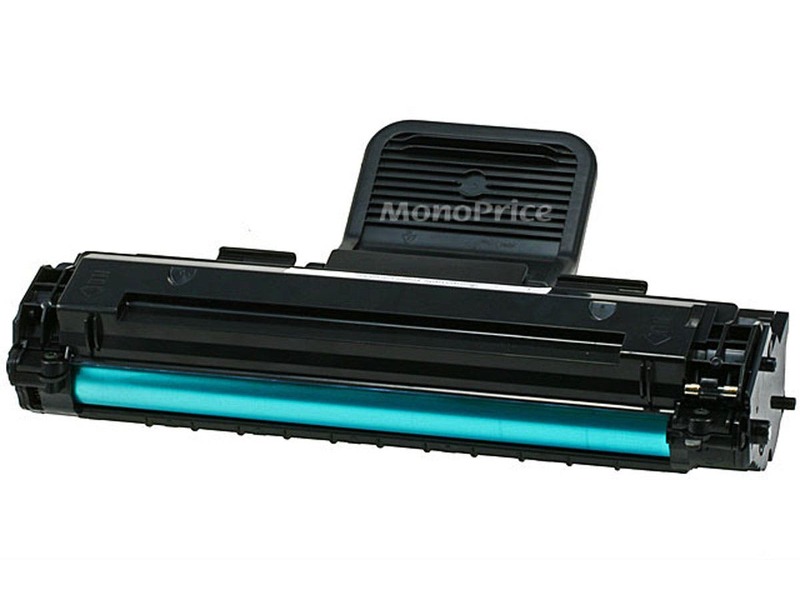 I will be purchasing my future toner cartridges from Monoprice again. I'm quite late with this review, as the cartridge this one replaced lasted much longer than I anticipated. As such, this cartridge sat in its box for about 18 months before being installed (if that has anything to do with the noise it makes, let me know and I'll pull this review). Whenever I print, something in the cartridge squeaks quite loudly (like a wheel in desperate need of grease). I was hoping it'd go away after a few prints, but it hasn't. Fortunately, I don't print very often. CONS: Sounds like a squeaky wheel. PROS: This is the third replacement black toner cartridge I have purchased from Monoprice for my Samsung SCX-4521 printer. The last two worked perfectly and were only a fraction of the price of one from the electronics stores. Monoprice has been a good place to shop. PROS: The best surprise is no surprise, and that is what this purchase gave me. I removed the old cartridge and inserted the new one, and it has been working like a charm for two weeks. I use these toner cartridges in a Samsung mono laser printer model CSX-4521F. I don't keep an actual page count on the total number of prints I can make out of one cartridge but I seems to be a lot and this refilled cartridge is certainly a lot cheaper than buying a virgin one. Definitely a worthwhile purchase. PROS: I have not actually used the laser toner cartridge I just received as yet but I have used this same model twice before with excellent results so I expect that this one will be just as good as the previous ones. I have ordered products from Monoprice a number of times in the past and have always be satisifed in the past. UPS had quick delivery. I have purchased cables from Monoprice in the past. They work as advertised. When I bought some the last time, I saw that they now cary toner cartridges for my laser printer. The price was right and I figured since the cables were good, the toner would be too. Boy, was I wrong! I opened the first box, pulle out the bubble wrapped cartridge and cut the plastic bag. Unfortunately for me, I had the bag facing down so I could pull out the cartridge. I cut the bag and about 1/4 lb of toner fell on me, the floor everywhere! I opened the other two (rightside up). The cartridges were covered in toner just like the first. Needless to say, back they went. I am now waiting to see what they are going to refund me. CONS: They leak toner all over the place. I have purchased several of these replacement toner cartridges for my monotone Samsung laser printer and so far they have been very reliable and long lasting and are only a fraction of the cost of a new cartridge. I figure if one does happen to fail and ruin my printer the cost of a printer has come so far down, I am willing to take the risk. If such a failure should occur I would take another look at buying these. Very satisfied customer. Will continue to use this product. PROS: I have used these for the last 3 years and everyone of them has performed great. I will be buying of theses in the future. Best price I could find for this toner. This is my third toner from Monoprice. Shipping was fast, everything as promised!